I love using small envelopes in my art journals. Not only are they super cute, they can also be functional! When I get letters from friends that are too large to fit, I fold them up and put it in an envelope. When I get a post-it note from my hubbie that's so sweet, but would clash horribly with my layout, I put it in an envelope. You could use them to press flowers, hold business cards, ticket stubs, and other momentos. If you're interested in making your own small envelopes, keep reading! Start by printing my envelopes template which can be found in the Printables section. If you print it as is, you will produce envelopes that are a little under 3.25 x 2.25". You could also scale the template to produce smaller envelopes by shrinking it under your print settings. I recommend transferring the templates to a heavy paper or cardstock. If your printer can handle thicker papers, you can print the template directly onto your desired template material. Unfortunately, my printer can't handle thick paper, so I cut my templates out from regular copy paper, traced it carefully onto thick 110lb. cardstock and cut it out. Trace the template onto a paper of your choosing. I have a piece of tan grid scrapbook paper here (I'm tracing on the back). Cut out along the line. For this envelope, fold the side flaps inward. Then fold the bottom flap up. Apply some glue to the edges of the bottom flap. Attach it to the side flaps. Fold the top flap down, and you're all done! It's the same concept for the other style. Fold the side flaps inward. The right flap should overlap the left side slightly. Apply glue to the right flap, and adhere it to the left flap. Apply some glue to the edge of the bottom flap and fold the bottom flap up. Apply glue to the bottom flap and fold it back up. Fold the top flap down and you're all done! 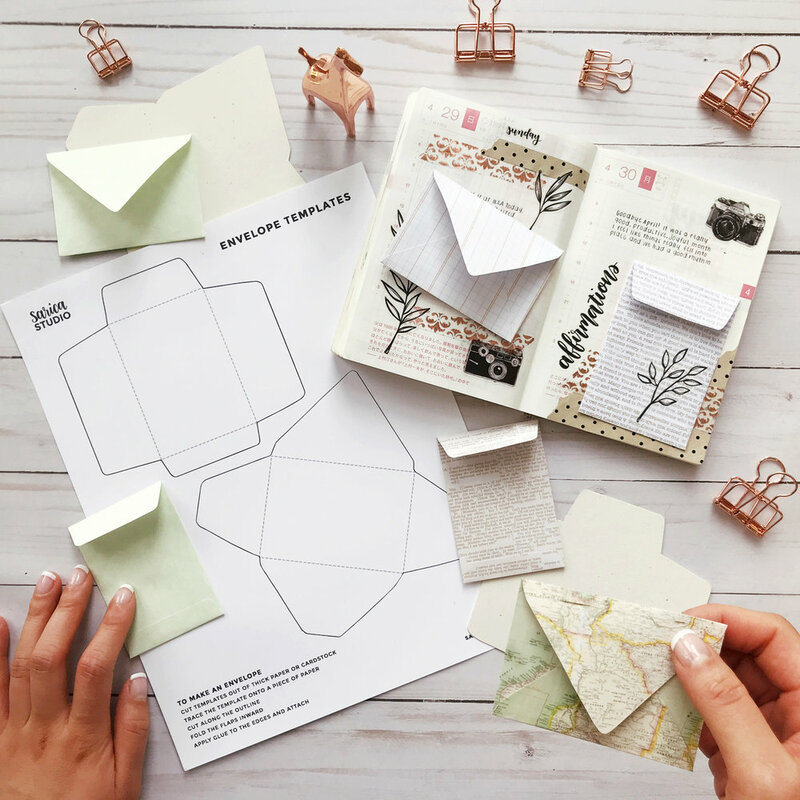 I hope you enjoy making miniature envelopes for your journal. Let me know if you found this helpful!. You can snag this template in the Printables section. Happy journaling!